The northern (and biggest) structure (Fig.1) is 8km minimum in diameter with three rings separated by depressions (as seen when using elevation techniques with NASA World Wind Landsat images). The external ring has discontinuities apparently caused by the presence of wind deposits (sand). In NE direction the ring loses circularity due to the action of a fracture. Inner circles show more continuity and present radial dips in the central zone. The most inner ring delimits a more depressed zone, crossed by a fluvial morphology. 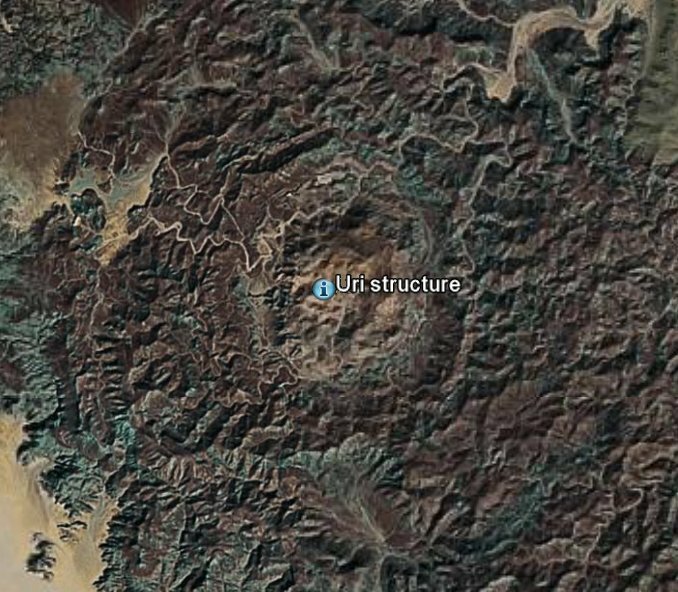 Images show landslides in the inner ring walls, and some volcanic buildings developed from fractures that affected -presumably post impact- the most external ring. The southern (and smallest) structure (Fig. 2) presents a 5 km. diameter and a multi-ring morphology. The structure is harder to appreciate because it is in a mountainous area, and because it is also more eroded than the northern one. Despite the previous description, there are two continued rings -separated by a depressed zone- and even a third one extending the affected area to 8 km. There is presence of some volcanic buildings developed from linear fractures in the rings, suggesting that the fractures and magma emissions are more recent than the structure formation. The new structures are not only aligned with Aorounga but are also aligned with this chain.